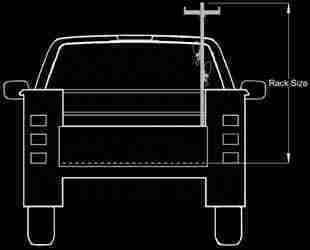 Ladder racks for utility body trucks, ladder racks mount to the side of open service bodies. VertiRack Rack Sale, 15% off all rack orders till April 30th.!!! One of the fastest growing rack manufacturers! VertiRackTM Vertical Ladder Racks are available to fit open service/utility body trucks. The ladder racks can be mounted to the inside surface, or the ends of the body's utility compartments. 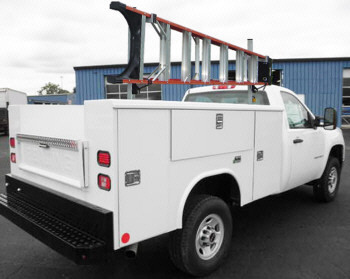 Open service/utility body ladder racks offer owners the convenience of carrying ladders on one, or both sides of the truck bed, without the hazard of creating a dangerous overhead obstacle for workers. VertiRackTM Vertical Ladder Racks can carry shorter ladders within the length of the truck utility bed, or can be sized to carry longer ladders extending over the truck cab. Open Service/Utility Body Truck Ladder Rack, Style 8. VertiRackTM Ladder Racks for Open Service/Utility Body Trucks.